Henry C. Walker, et al, Milan, OH. 1848 Buffalo - Monteal, QUE. 1850 Buffalo - Sandusky service. 1853, Jun Repaired after leak. 1854, May 8 Owned W.W. Wilkinson, Toledo & James M. McKinlay, St. Clair. 1856, Nov 4 Stove bottom & sank, Grand River, Lake Erie. 1859, May 12 Owned Capt. Reuben H. Becker, Cleveland. 1859, Oct 9 Grounded Cleveland, Lake Erie. 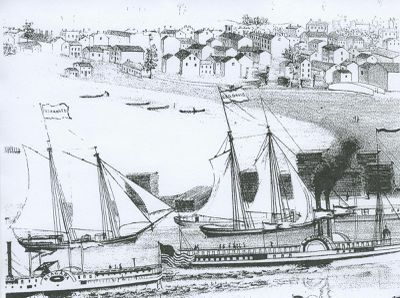 1861, Apr Struck pier & sank, Welland Canal. 1861, Nov Collided with schooner ATHENIAN, Lake Erie? 1863 Owned Roach & Connon, Chicago, IL. 1863, Oct Wrecked Port Burwell, ONT.